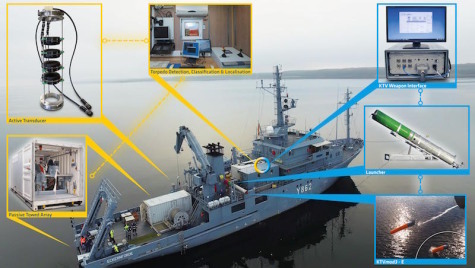 Atlas Elektronik GmbH announces successful SeaSpider sea trials in cooperation with the German Bundeswehr Technical Center for ships and naval weapons, maritime technology and research (WTD 71). The full “sensor to shooter” functional chain of a hard-kill surface ship torpedo defense system with Torpedo Detection, Classification and Localisation (TDCL) and the SeaSpider Anti-Torpedo-Torpedo (ATT) has successfully been demonstrated on a surface ship. Trials in the Baltic Sea for torpedo defence studies were conducted on a WTD 71 multipurpose vessel. These comprised the full functional chain with TDCL sonar and the third generation SeaSpider prototype with its above water launcher. At the WTD71 test range, both a Mk37 torpedo-derived AUV and torpedoes of the DM2A3 type served as the threats, which were detected and localised with passive and active TDCL and the attendant data was used to cue the SeaSpider launch. SeaSpider acquired the threats and homed in into closest point of approach (CPA). Successful “intercept” equivalent CPA was verified by acoustic and optical means. After full evaluation of the trial results in 2018, information and pictures of the trials have now been approved for release. Atlas Elektronik appreciates the cooperation with the German Bundeswehr Technical Center for ships and naval weapons, maritime technology and research (WTD 71) in the ongoing torpedo defense studies. In parallel, Atlas Elektronik is conducting company funded serial product development of the SeaSpider ATT and the Atlas Elektronik surface ship torpedo defence suite. The Atlas Elektronik Group holds a leading position in all fields of maritime high technology, from command & control systems including radio & communication systems for submarines, surface combatants and mine warfare systems and ranging to heavyweight torpedoes, coastal surveillance systems and in-service support. The electronics specialist is an operational unit of Thyssen Krupp Marine Systems and has a workforce of around 2.200 highly skilled employees. Thyssen Krupp is a technology group with traditional strengths in materials. Over 160,000 employees in 78 countries work with passion and technological know-how to develop high-quality products and intelligent industrial processes and services for sustainable progress. Their skills and commitment are the basis of our success. In fiscal year 2017/2018 Thyssen Krupp generated sales of €42.7 billion.